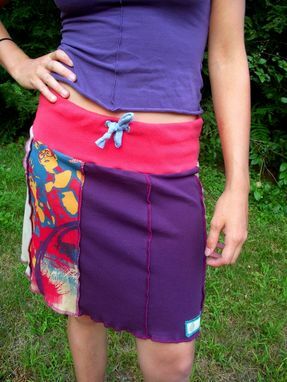 This is an adorable, fun and super comfy skirt made of entirely upcycled cotton jersey knit materials. 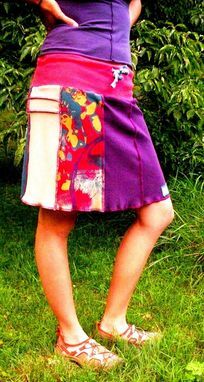 The patchwork features brightly colored panels of deep purple and blue featuring a cirque du soleil reminiscent front panel. The side panels are made of a nuetral tan. The wide, drawstring waistband is made of a bright red with chrome eyelets for added durability. Perfect for throwing on after yoga or over workout shorts! Great for anyone feeling youthful! 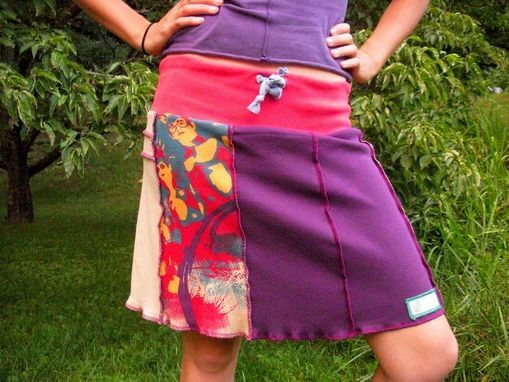 Although this material is stretchy and forgiving, this skirt is most suited for those wearing a size medium. In a relaxed, unstretched position, the waistband measures 33", and can stretch to fit a waist/hip area of up to 37". Measures 18" from top of waistband to bottom hem. Darkstar label on bottom left hem. As with all my clothing, the seams are serged, and this item features reversed stitching for decorative appeal. Want a different size or colors? I would be happy to make you something, just message me!